Are you too good to your pet? 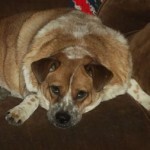 Obesity in pets, both dogs and cats, is rampant. In fact, the percentage of overweight and obese cats is higher at 57.6%, than dogs at 52.6%. How do you know how much to feed your pet?